Everything about Shoppe was designed to make visitors feel at home, from the comforting candle aromas that waft through the store to the pooch that greets you on the front porch, ready for a good head scratch. Longtime purveyors of plants, Mark Thompson and Jay Draper opened Shoppe in the Forest Park neighborhood last fall. Their vision for the store, which is located inside a 1920s bungalow that’s served several purposes throughout the years, was to bring some old-fashioned charm and quaintness to the neighborhood. While polishing a few antique dishes, which he will later use as makeshift “plant coasters,” Mark says he thinks Shoppe taps into a yearning people have for the simpler things, like a potted plant that breathes life into an empty windowsill or a handsome coffee table book that begs to be read. “I think there’s been a renewed appreciation for plants,” says Mark, who along with having an undeniable green thumb has also studied interior design. Perched atop a small hill off Clairmont Avenue, Shoppe and its neighboring greenhouse fit in seamlessly with the neighborhood’s quaint vibe. 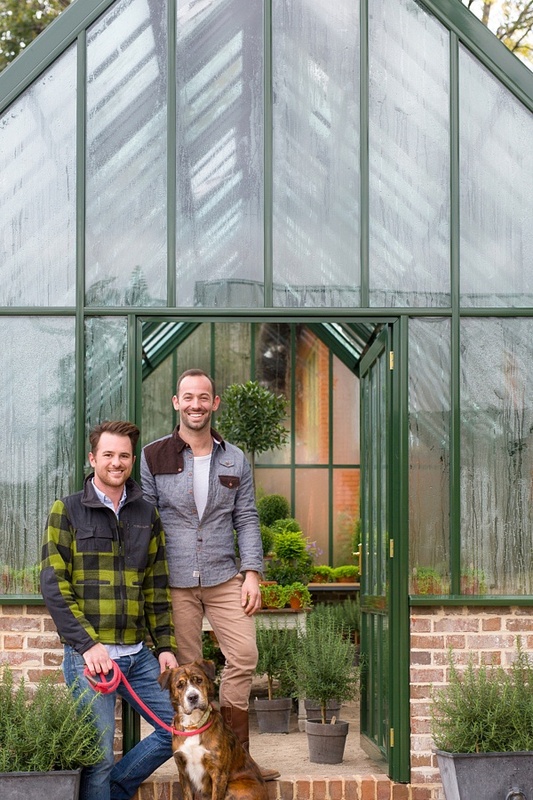 And while Mark and Jay have allowed the structure to retain some of its original charm — like the brick fireplace that now serves as a ledge for various pots and plants — they’ve taken some artistic liberties in other spots. Chic light fixtures made out of baskets illuminate the space, while a backroom ceiling adorned with a cross-section of wood brings a layer of rustic warmth. Much of the space, Jay says, was decorated with the pair’s distinctive taste in mind. The same goes for the store’s eclectic inventory. “What we did for the most part, product-wise, was we tried to mix in a lot of things we like and things we use,” Mark says as he motions to a row of dog collars and leashes that the pair uses for their own furry friends. 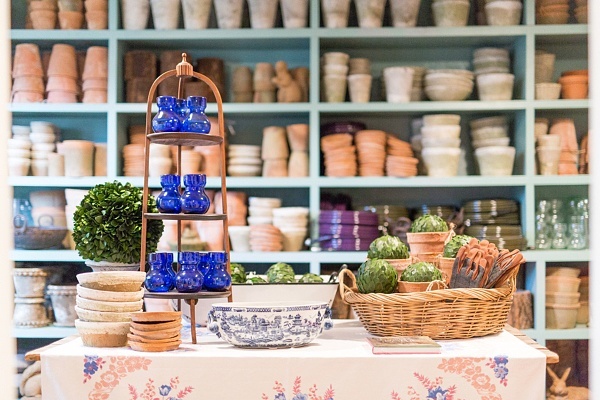 Along with a variety of plants, the store also offers candles, soaps, pots, antiques and several books on gardening, Southern culture and anything else that may pique the owners’ interests. Located directly next to the store, the greenhouse is where the duo envisions rows of plants lining the walls once spring makes its debut, bringing with it a reprieve from a rare Alabama cold spell. “From what we can tell, this lot has never been used before,” Mark says of the patch of land where Shoppe’s small greenhouse now stands. Almost all of the store’s inventory is sourced locally. As more people begin to discover the verdant haven, Mark says he hopes Shoppe can become a go-to spot for locals looking for items to bring life — literally — to their homes. As the winter slips away and makes way for graduation, Mother’s Day, wedding season and more, the duo also expects their florist, event florist and gardening services to pick up. From floral arrangements to container gardens to weddings and any kind of party you can imagine, they will be busily — and happily — putting their green thumbs to work creating beautiful botanical creations. 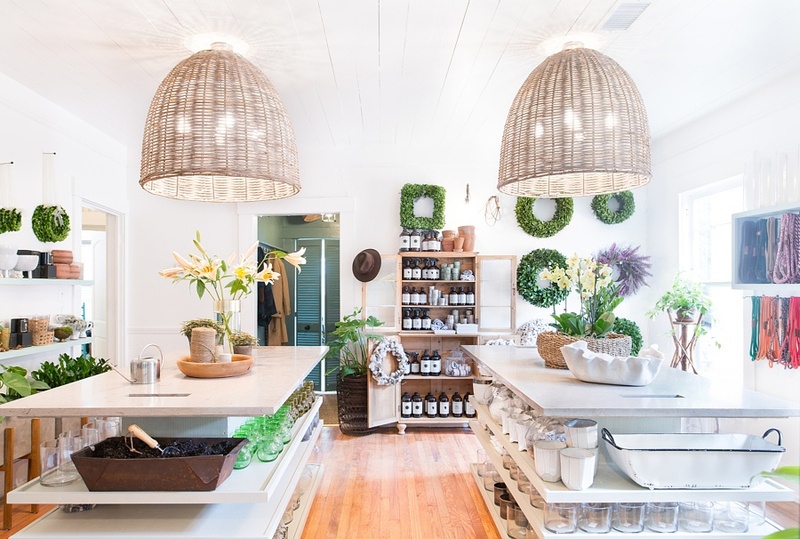 While locals can count on Shoppe to not only provide floral and garden services, the store will always carry an abundance of plants and decor finds in a broad variety. Customers can also expect to discover something new every time they visit. “No season will ever look the same at Shoppe,” Mark says. Shoppe is located at 3815 Clairmont Ave., Birmingham, AL 35222. Hours are Tuesday through Saturday, 10 a.m. to 6 p.m.; Sunday, noon to 4 p.m. For more information, visit shoppebham.com.